For the month of April ZWV will be sponsoring a Bring Your Own Mug campaign at Vashon Coffee stands. Nadine will be back at Kimco’s to collect styrofoam on April 7th. 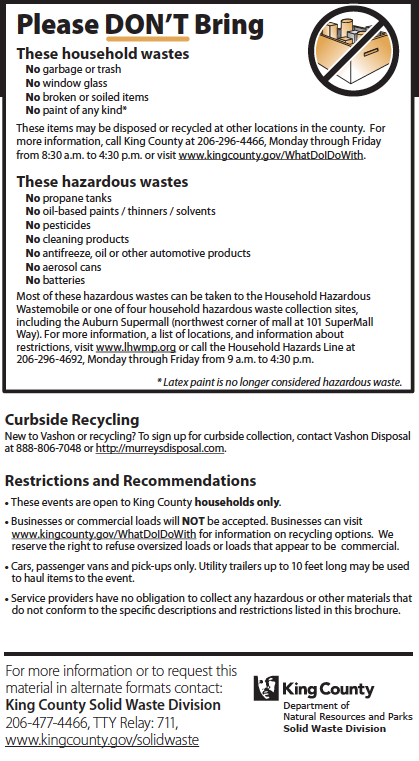 On April 12-14, King County will have the Hazardous Wastemobile on site at the Tjomsland Gravel Pit. Hazardous Waste Disposal And on April 20th ZWV will be hosting another Electronics Recycling Event from 10am to 12 noon. 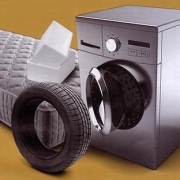 King County will be holding a recycling event at the Tjomsland Gravel Pit on Saturday, August 18th from 9am to 3pm. The link below is to the mailer sent out to all Vashon residents. Each year approximately 35,000 people attend the Strawberry Festival. 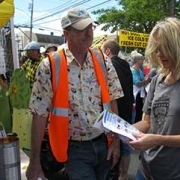 This fun annual event creates a lot of garbage, totaling about 140,000 pounds of combined materials that is usually trucked off island to the landfill. That’s not very “green”; we can do better. A large portion of festival waste is recyclable. 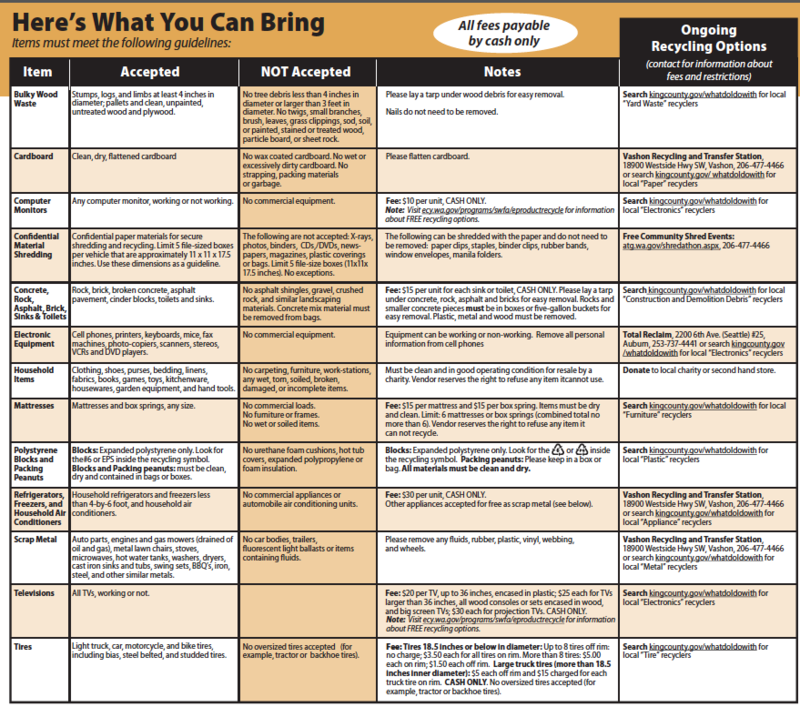 This year, Zero Waste Vashon will be managing 17 recycle and food waste stations to keep recyclables like food, aluminum, glass, and paper out of the landfill and used as a resource. ZWV needs volunteers to help monitor the stations, bring the recyclables and food waste to the central collection point, measure progress, and help Festival-goers get everything in the right place. Please consider volunteering with Zero Waste Vashon to help make our Greener Strawberry Fest a success! The shifts are just 2-3 hrs. This link will take you to the volunteer sign-up page where you can learn more about the jobs and available time slots: If you prefer to sign up over the phone, please contact Marian Whited, Volunteer Coordinator at 206-909-3534. If you are unable to volunteer, you can still help by sorting your waste into the correct bins: Mixed Recycling, Food Waste and Trash. Keep an eye out for the “Waste Not Want Not” flags above the waste stations, and please stop by the ZWV booth in front of Hinge Gallery for some Green ideas and freebies . 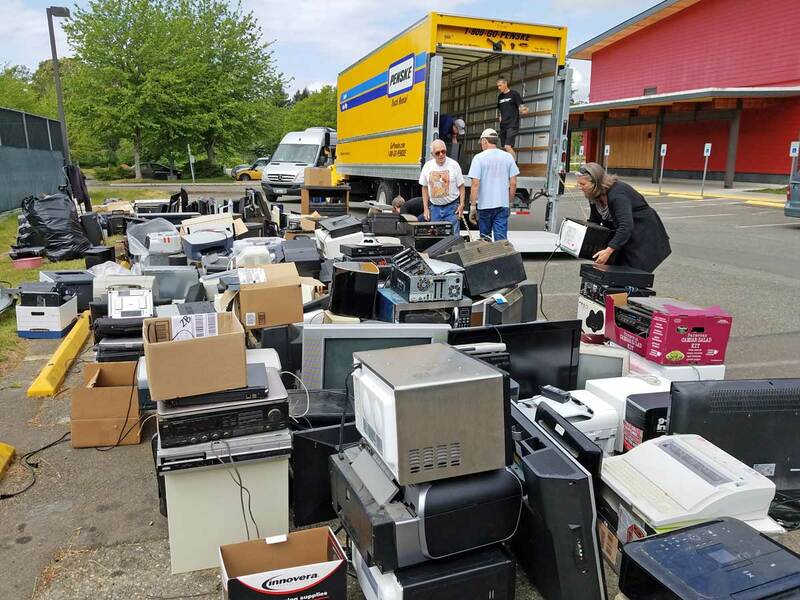 Thanks to our partners Waste Connections, BioBags, King County Solid Waste, and the Vashon Chamber of Commerce for supporting this project to make Vashon even Greener!